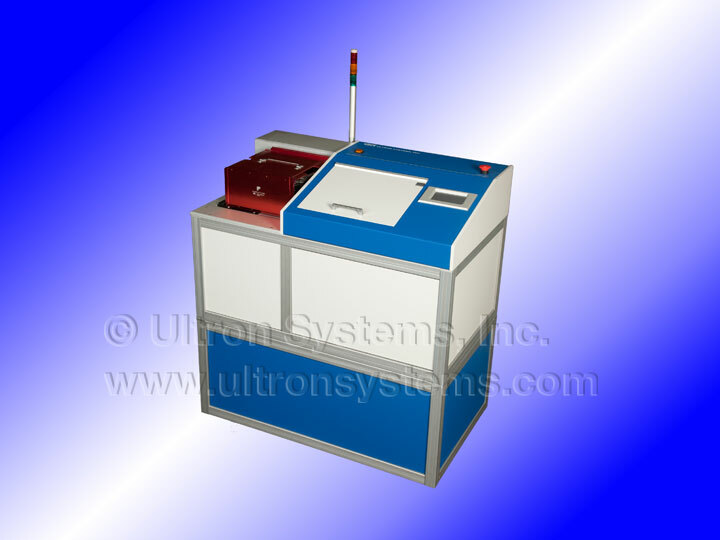 Ultron Systems' Models UH102-8 and UH102-12 UV Curing Systems offer inexpensive solutions for the curing of UV films in easy-to-use benchtop packages, without sacrificing control or versatility. 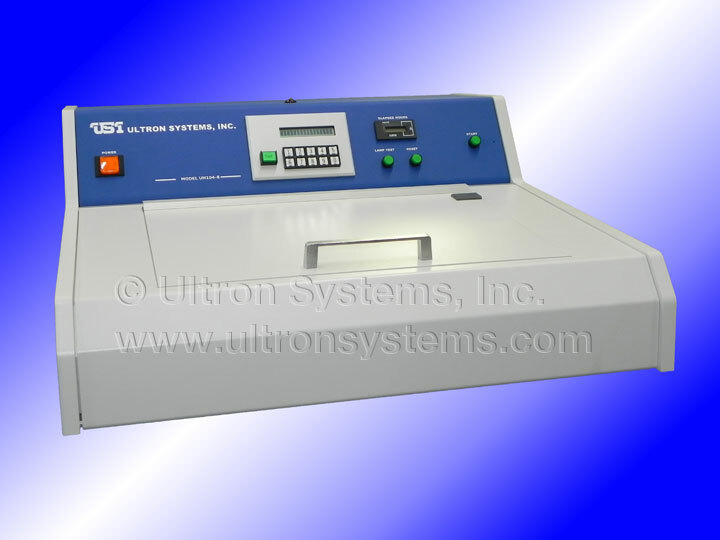 - Compact, desktop profile accommodates up to 8" (200mm) grip ring or film frame-mounted wafer on UH104-8; up to 12" (300mm) on Model UH104-12; rectangular substrates up to 12.3" square on the Model UH104-12W. 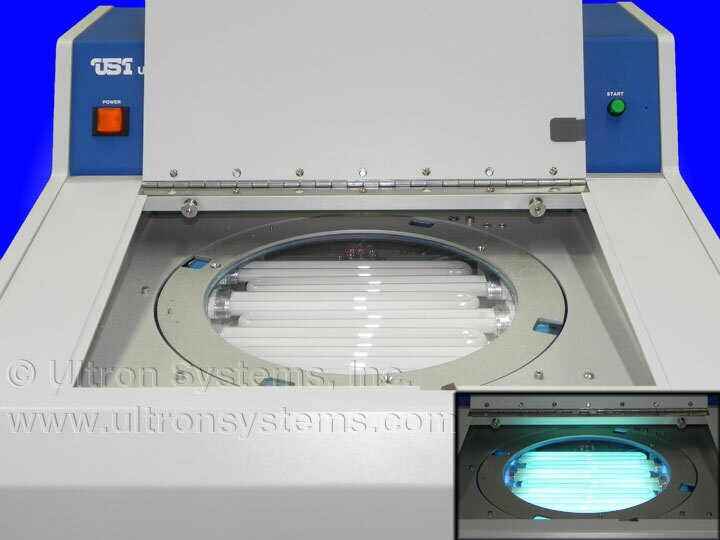 - Film Frame Adapters: 3"-4", 6", 8"
- Ring Adapters: 6", 6.5", 7", 8"
- Film Frame Step-down Adapter - 6", 8"
The Model UH105 Series LED UV Curing System is our newest product for highly efficient and cost-effective wafer curing. 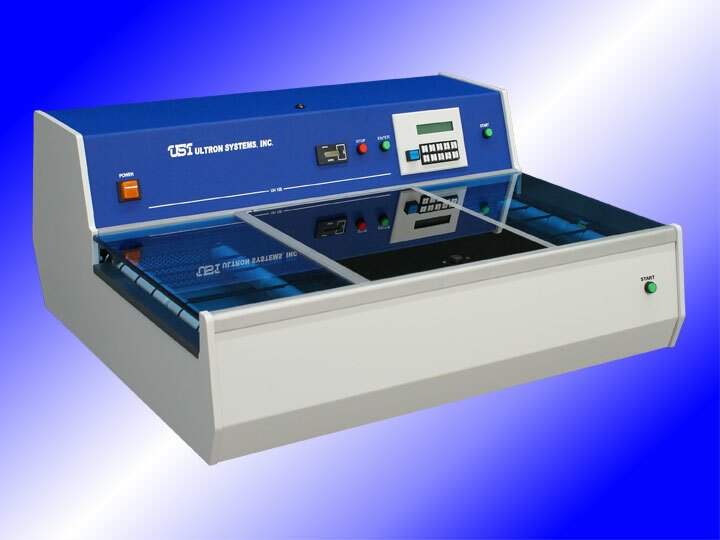 LED light-curing technology offers significant benefits over conventional lamp-based UV curing systems including lower operating costs and instant startup for on-demand curing. The Model UH105 Series offers the same uniformity of UV exposure and fast curing times as other semiautomatic and automatic high-end UV curing systems and generates a cool, low-temperature UV-A 365nm curing process while eliminating both ozone and mercury safety risks. 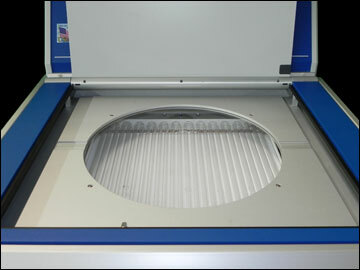 A fast conveyor system advances the wafer (and subsequently ejects it upon completion) while slowing to -- and maintaining -- desired speed programmed for optimal curing. 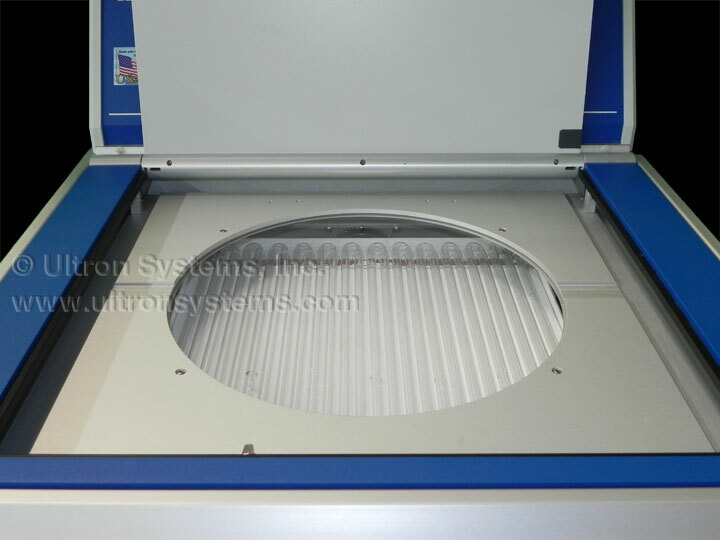 - Compact, desktop profile accommodates up to 8" (200mm) grip ring or film frame-mounted wafer, and rectangular substrates up to 8"(w) x 12"(l). 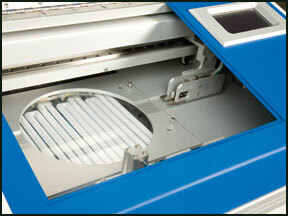 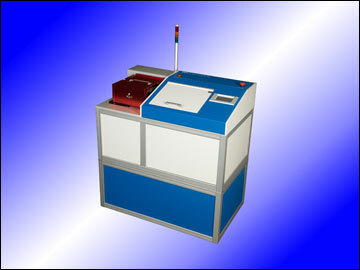 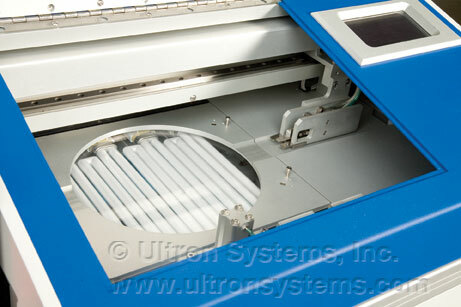 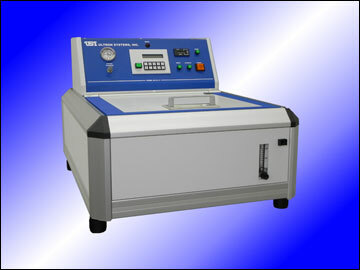 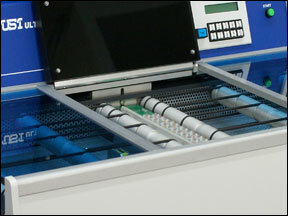 Ultron Systems' Model UH204 UV Curing System is our answer for your increased demand and productivity. 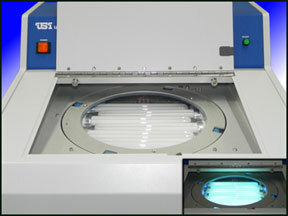 The Model UH204 is a fully-automatic UV tape exposure solution that boasts both high efficiency and cost-effectiveness. 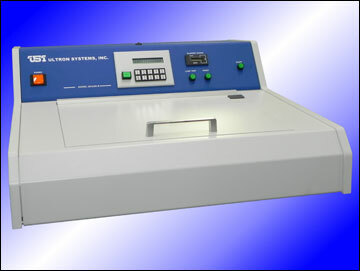 Curing time is extremely fast -- comparable to other high-end UV curing systems -- while maintaining UV exposure uniformity. 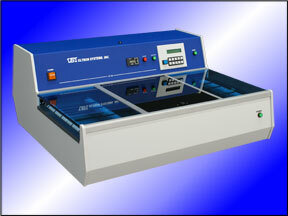 The curing incorporates a cool, low-temperature UV-A 365nm process, with an environmentally safe, ozone-free UV lamp array.